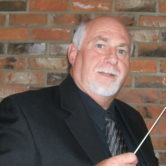 Mike Townsend, Supervisor of Music (retired), Grande Prairie School District, Alberta Canada, taught concert band, jazz band, orchestra, for 38 years and community marching band for 45 years. Presently a member of Alberta Band Association, the Vice President of WAMSB International (World Association of Marching Show Bands), Newsletter Editor for PhiBetaMu International, Past President of the Alberta Chapter of PhiBetaMu-MuAlpha, and Regional Coordinator for MusicFest Canada. Mike’s bands have represented Canada in the United States, Australia, Germany, Sweden, Denmark, Italy, Brazil, China, United Kingdom and Austria. Mr. Townsend is active as an adjudicator and clinician in Canada, Denmark, Spain, Germany, Caribbean, Indonesia, Brasil, Colombia, Poland, Mexico, and Taiwan and has assisted in procuring instruments and establishing band programs in Dominica, West Indies. Mike has served on the board of Canadian Band Directors Association, Alberta Band Association, Music Alberta and PhiBetaMu International. Mike is a recipient of the Tommy Banks Jazz Educators Award, the Alberta Band Association’s David Peterkin Award of Excellence, the Vondis Miller Legacy Award, the PhiBetaMu International Award of Merit and most recently the Queen’s Diamond Jubilee Medal of Honour.